Located on the Billy the Kid Scenic Byway, Capitan, New Mexico Provides the visitor with a quiet and historically significent beginning for their discovery of Lincoln County. An ionteresting stie in terms of Billy the Kid can be found at: Billy The Kid Outlaw Gang. Remember...it does NOT matter where you begin your journey of the beautiful and scenic Billy the Kid Scenic Byway, its what you learn, remember and take home with you! Capitan is located in a very advantageous position for you to experience the beauty, history, and sights of Lincoln County. We are located on Highway 380 only 12 miles from the old town of Lincoln, NM, where the location of the Lincoln County War and the last excape of the infamous Billy the Kid took place. Capitan provides affordable lodging and food as well as the chance to visit the birthplace and burial site of the famous Smokey Bear, our National Forest Service's symbol. Whenever you are in the area for vacation, business or just to get away from everything please stop by or give us a call in advance and reserve your room. Smokey Bear Motel is like stepping back into a more simple time in American history where you will not find hallways, elevators or parking a mile from your room. 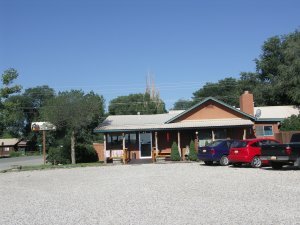 What you will find is a quaint, hospitable motel with a down home flavor that can honestly boast, "Some of the most clean, quiet, comfortable and convenient rooms that are a beautiful, close and scenic drive to everything you would want to see in Lincoln County, New Mexico! We are only a few miles from Ski Apache and a few minutes of scenic driving to the casinos! Save your money on lodging and meals to enjoy the many enjoyable and entertaining aspects of Lincoln County! You will find that everything you will wish to see is within a 45 minute drive and you can cover all of the historical and entertaining attractions available to you in Lincoln County through day trips!"